Disney’s Pirates of the Caribbean: Dead Men Tell No Tales “- the fifth film in the now-iconic “Pirates of the Caribbean” film franchise-will sail home on 4K Ultra HD™ on September 19, and on 4K Ultra HD™/Blu-ray™ Combo Pack, DVD and On-Demand on October 3. Fans who bring home “Pirates of the Caribbean: Dead Men Tell No Tales” will experience the nonstop action in stunning 4K Ultra HD format, the ultimate home entertainment experience with next-generation high dynamic range (HDR) visuals and Dolby Atmos immersive audio. 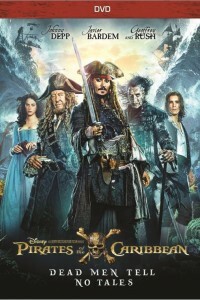 The rip-roaring adventure-packed with humor, suspense and jaw-dropping special effects-finds down-on-his-luck Captain Jack feeling the winds of ill fortune blowing strongly his way when deadly ghost sailors, led by the terrifying Captain Salazar (Bardem), escape from the Devil’s Triangle bent on killing every pirate at sea-notably Jack.